Did Jack London possibly have a happier year than 1905? He was acclaimed as an author, journalist, popular speaker, and was finally married to his soulmate, with whom he purchased a farm near Glen Ellen that he first called "Land of Dear Delight," later to be expanded into his beloved "Beauty Ranch." And if it wasn't for the fact that he was a damned Socialist, Jack might have presented Luther Burbank with serious competition for the throne as Imperial Sonoma's favorite son (adopted). London at the time was not only the author of two recent runaway best selling novels, The Call of the Wild and The Sea Wolf, but won due respect for his exclusive coverage from the 1904 Russo-Japanese War front while other top-name reporters from Western newspapers were sequestered in Tokyo hotels. Writing for Hearst's San Francisco Examiner, London and his small troupe of guides rode hundreds of miles on horseback in winter through countryside that had never seen a Westerner -- only to be turned away by the Japanese command a few miles from the combat. Early 1905 found Jack London at odds and under stress. He was in the middle of a divorce from Bessie, the mother of his two girls; his publisher, Macmillan, was demanding a new hit book, and even threatening to charge him interest on the advances paid so far; and worst of all, his doctor discovered a tumor (specific details unknown). London had surgery in March, and the tumor was found benign -- and to his doctor's dismay, London resumed smoking cigarettes immediately. But there was still a month or so of recuperation, where Jack and fiancee Charmian Kittredge spent quiet days together. 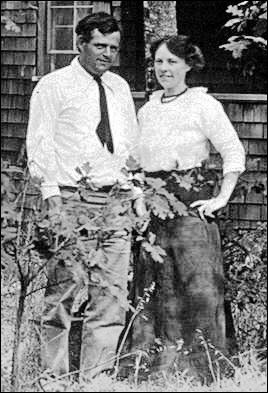 By spring, Jack London was in Glen Ellen at Wake Robin Lodge, where Charmian lived with her aunt and uncle. London had an adjacent two-room cabin which he shared with two dogs including one named "Brown," an Alaskan Husky with a limp that he had been given to him by relatives of "an old Klondiker." In her memoirs, Charmian wrote that the dog was slow to bond with London, which became the topic of a short story, "Brown Wolf," about the original owner's ironic return. As Jack was then starting to write White Fang (the companion novel to Call of the Wild, about the domestication of an Alaskan dog-wolf), Brown undoubtedly played a part inspiring that work as well. Two weeks later, Jack and Charmian visited for the first time the farm that would be the core of their celebrated ranch outside of Glen Ellen, and the next day London made an offer to buy it. Soon thereafter the Press Democrat announced that the couple was engaged, and that Jack had hired a local contractor to build an elaborate "barn" where they would live until their "summer house" was built. The house-barn was never built; the project was abandoned by autumn. Worth noting are the shared architecture between the barn and later design of Wolf House, with heavy peeled-log beams, tile roof, and insistence that everything be almost fire proof. "As the weeks warmed into summer, campers flocked to Wake Robin, and the swimming pool in Sonoma Creek, below the Fish Ranch's banks, was a place of wild romping every afternoon. Jack taught the young folk to swim and dive, and to live without breathing during exciting tournaments of underwater tag, or searching for hidden objects. Certain shiny white doorknobs and iron rings that were never retrieved, must still be implanted in the bottom of the almost unrecognizable old pool beneath the willows, or else long since have traveled down the valley to the Bay. "There were madder frolics on the sandy beach at the northern edge of the bathing hole, and no child so boisterous or enthusiastic or resourceful as Jack, 'joyously noisy with life's arrogance.' He trained them to box and to wrestle, and all, instructor and pupils, took on their varying gilds of sun-bronze from the ardent California sky that tanned the whole land to warm russet." When he otherwise wasn't writing best-sellers, recovering from surgery, and adventuring with his fiancee, London was highly active in politics that year, running for mayor of Oakland (he received 981 votes, and later said, "I wouldn't let my name be used if I thought there was the slightest possibility of winning"). He lectured often on the merits of socialism, leading the (usually) labor-friendly Santa Rosa Republican to denounce him as a "dangerous member of society." In the party of callers with Mr. London was Miss Charmion [sic] Kittredge of Glen Ellen. From here they rode to Burke's to visit some of Mr. London's friends here. When some weeks ago Jack London the novelist rode horseback to Santa Rosa from Glen Ellen to visit Luther Burbank, hs fair companion, also on horseback, was Miss Charmion Kittredge. It was then hinted in the story of the visit that Miss Kittredge was London's betrothed. Ther had been rumors for some time that the novelist had won the hand and heart of the attractive girl, who has been spending considerable time at Glen Ellen with relatives and who has also resided at Berkeley. In his "War of the Classes," London strives to identify labor unions with socialism and says this of the leaders of that movement: "They intend to direct the labor revolt to the capture of the political machinery once in their hands, which will also give them control of the police, the army, the navy, the country, they will confiscate, with or without remuneration, all the possessions of the capitalist class, which are used in the production and distribution of the necessaries and luxuries of life." If this is to be the character of London's future literary work, he is doomed to certain and early eclipse. His stories of sea life and Alaskan scenes have won for him a great vogue, for his is a virile, bold and striking style. But success apparently has turned his head so that his socialistic notions have actually run to seed placing him quite outside the pale of that large class with whom he was proud to associate. A very natural question is raised by reason of London's strange preachment: "Would his ravings about the war of the classes, with their pointed invitation to lawless agitation, command even serious consideration outside of a very limited circle of ultraradicals if London, as a writer of successful romance, had not caught the popular fancy as a rather clever young man?" He is not yet 30, though that is not against him, and from press comment, enjoys almost as much respectful attention when speaking or writing upon his peculiar doctrines as do men twice his age who have spent thirty years in studying the various phases of socialism.